Dr. Mark Cohan is a former Connecticut teacher, principal and superintendent. In 1990, as then principal of Farmington High School, Dr. Cohan became active in CAS, first as a member of the legislation committee and, ultimately, as a member of the CAS Board of Directors. He was a very vocal and respected voice for principals and made myriad contributions to the association for the many years leading up to his transition to district administration. In this highly politicized era in education, there is a consensus that significant changes are needed to improve our schools. What do school leaders think? Since our leaders are self-protective and guarded in their public statements, few people have access to their innermost thoughts and concerns. This book is a personal account of a year in the life and work of a superintendent. 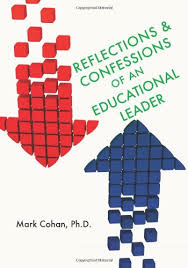 Woven through this reflective journal are recollections and analyses of the first thirty-five years of Mark Cohan’s career in Connecticut’s schools, from his decision to become a teacher, through leadership experiences in each of the districts where he worked. Anyone who is curious about the inner life of an educational leader will find this candid book to be a unique resource. This includes parents, teachers, board of education members, legislators, students preparing to become educational leaders (and those who teach them), as well as other citizens who are curious about exactly what needs to be improved in our schools, and why the reform process has been agonizingly slow. The book ends with an extended description of the nature of transformative leadership, including practical suggestions for moving forward on behalf of our students. Dr. Cohan’s book is now available on amazon.com.